QTransform differs from QMatrix in that it is a true 3x3 matrix, allowing perspective transformations. QTransform's toAffine() method allows casting QTransform to QMatrix. If a perspective transformation has been specified on the matrix, then the conversion will cause loss of data. QTransform provides the isIdentity() function which returns true if the matrix is the identity matrix, and the isInvertible() function which returns true if the matrix is non-singular (i.e. AB = BA = I). The inverted() function returns an inverted copy of this matrix if it is invertible (otherwise it returns the identity matrix), and adjoint() returns the matrix's classical adjoint. In addition, QTransform provides the determinant() function which returns the matrix's determinant. Finally, the QTransform class supports matrix multiplication, addition and subtraction, and objects of the class can be streamed as well as compared. A QTransform object contains a 3 x 3 matrix. The m31 (dx) and m32 (dy) elements specify horizontal and vertical translation. The m11 and m22 elements specify horizontal and vertical scaling. The m21 and m12 elements specify horizontal and vertical shearing. And finally, the m13 and m23 elements specify horizontal and vertical projection, with m33 as an additional projection factor. The various matrix elements can be set when constructing the matrix, or by using the setMatrix() function later on. They can also be manipulated using the translate(), rotate(), scale() and shear() convenience functions. The currently set values can be retrieved using the m11(), m12(), m13(), m21(), m22(), m23(), m31(), m32(), m33(), dx() and dy() functions. Translation is the simplest transformation. Setting dx and dy will move the coordinate system dx units along the X axis and dy units along the Y axis. Scaling can be done by setting m11 and m22. For example, setting m11 to 2 and m22 to 1.5 will double the height and increase the width by 50%. The identity matrix has m11, m22, and m33 set to 1 (all others are set to 0) mapping a point to itself. Shearing is controlled by m12 and m21. Setting these elements to values different from zero will twist the coordinate system. Rotation is achieved by setting both the shearing factors and the scaling factors. Perspective transformation is achieved by setting both the projection factors and the scaling factors. See also QPainter, Coordinate System, Affine Transformations Example, and Transformations Example. All elements are set to zero except m11 and m22 (specifying the scale) and m33 which are set to 1. 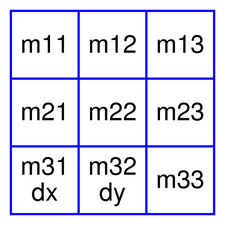 Constructs a matrix with the elements, m11, m12, m13, m21, m22, m23, m31, m32, m33. Creates a matrix which corresponds to a scaling of sx horizontally and sy vertically. This is the same as QTransform().scale(sx, sy) but slightly faster. Creates a matrix which corresponds to a translation of dx along the x axis and dy along the y axis. This is the same as QTransform().translate(dx, dy) but slightly faster. Note: A rotation transformation of 180 degrees and/or 360 degrees is treated as a scaling transformation. Resets the matrix to an identity matrix, i.e. all elements are set to zero, except m11 and m22 (specifying the scale) and m33 which are set to 1. Sets the matrix elements to the specified values, m11, m12, m13 m21, m22, m23 m31, m32 and m33. Note that this function replaces the previous values. 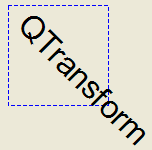 QTransform provides the translate(), rotate(), scale() and shear() convenience functions to manipulate the various matrix elements based on the currently defined coordinate system. Returns the QTransform as an affine matrix. Warning: If a perspective transformation has been specified, then the conversion will cause loss of data. The transformation type is the highest enumeration value capturing all of the matrix's transformations. For example, if the matrix both scales and shears, the type would be TxShear, because TxShear has a higher enumeration value than TxScale. Knowing the transformation type of a matrix is useful for optimization: you can often handle specific types more optimally than handling the generic case. Returns true if t1 and t2 are equal, allowing for a small fuzziness factor for floating-point comparisons; false otherwise. Returns the hash value for key, using seed to seed the calculation.